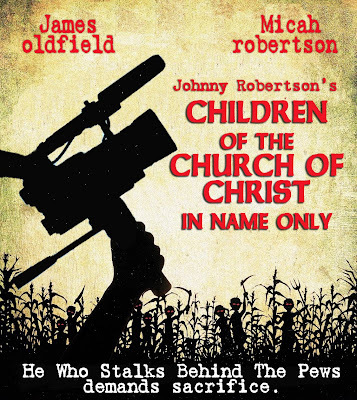 First things first: Earlier this week somebody suggested that we should begin referring to local cult leader Johnny Robertson as "He Who Stalks Behind the Pews". Speaking of video cameras, a number of people have informed me that during his four hours of "Religious Review" this past week that Johnny Robertson put the word out to all(?) of his viewers that he wants them to begin covertly video recording all the churches in this area with video cameras, cellphones, iPhones etc. and to send the footage to him. Between his obsession with Martinsville-based television station BTW, his constant scheming to destroy Baptists and Pentecostals and Methodists (especially Baptists), his harassing innocent people in their own homes and churches and store parking lots, his monitoring both feeds of WGSR to watch for dissenters, and now trying to amass an army of spies, does Johnny Robertson ever, like... you know, minister to the members of his own church? Doesn't seem right, somehow. Yet another blog has popped up to counter Johnny Robertson and his so-called "Church of Christ". Whoever is behind it is already asking hard questions about the hyper-legalist doctrine of the cult as well as the lingering enigma regarding Jason Hairston's departure from the cult. Word on the street, is supporters of John are starting to see through him, meetings have transpired as to a solution. Even the Preaching School was created on lies and deceit via pictures, names of attendees. Funds were raised via a list of names and pictures of those who were supposedly enrolled. After some dropped from the program, funds were still being raised as if the program still had the same enrollees. It is quite clear that the purpose of the training school, was not to make “Gospel Preachers” but created solely to make clones – clones of John. John knows he has lost support and also realizes that his negative popularity is hurting his cause, rather than furthering his agenda. In desperation, he has tried to push more air time, as if this will help. Watching a few shows one can quickly see that the show revolves around his ego. Seldom is Jesus referenced on his shows. He is more interested in picking apart the flaws of others than he is in reaching lost souls. And, NEVER do you hear him discussing the many problems within the Church of Christ. Why not? Well, simply put, it would show him to be like the rest of us – IMPERFECT. He falls short with morality and doctrinally, just as everyone else. But, pride comes before the fall and he dare not acknowledge his short-comings nor will he disclose information regarding the many disagreements within the Church of Christ; and folks these are not just some minor disagreements, they involve doctrine. The “Doctrine of Christ” becomes whatever each sect within the Church of Christ deems it to be. Also, there is so much disagreement over “the gospel”-- not the Gospel about Jesus, but the gospel of scriptural interpretation. If you teach something like one cup MUST be used during communion, the multiple cuppers are labeled preaching “another gospel.” Many splits have occurred because one group says the other church of Christ sect is preaching “another gospel.” In both cases, Johns teaching on the “Doctrine of Christ” and Paul’s teaching to the Galatians are twisted and ripped from context and then used to divide the Church – a sin that Paul condemned strongly. John is a master at such misapplication of scripture, often ripping a verse from it's context and giving his own private interpretation which we are warned not to do. Cults are masters of scripture manipulation and this brings me to the million dollar question: Is John Robertson a cult leader? YES!! Is the Church of Christ a cult? NO!! Many conservative Church of Christ are loving people, teaching the truth in love, not wanting to control peoples minds, but lead them to Christ. John wants his cultish ego fed and many afar off are staring to see this. If you are reading this, and desire to stay in the Church of Christ, there are others in town who know John is a cult leader and they will gladly accept you and will do so in love and not attempt to control your minds. Last night during my personal Bible study (so far that's all I'm reading this Lenten season, having vowed to give up reading for pleasure :-) I did some study in 2nd Corinthians. Beginning in the eleventh chapter, Paul has a lot to say about as he puts it the "super-apostles" who were puffing themselves up with legalism. They thought that by following "the rules" that this would give them more merit than other Christians. Paul rails against them and not just because they were trying to destroy Paul's ministry either. These people were bringing back the same rule of law that Christ's substitutionary death had put an end to. In effect, these people were undoing the finished work of Christ at Calvary. It's not by any work of our own, lest we should boast! We are saved by the grace of God, and not by the grace of other men. I cannot put it any more plain than this: to insist otherwise, is a very evil thing. Perhaps the most evil thing possible in this world. Christ came to free us. Men like Johnny Robertson and his followers lust to enslave others... and in the name of Christ, no less! And I'm going to keep stating the obvious for however much I have to, regardless of any intimidation or threats from Johnny Robertson and his lackeys. Maybe you're right. I haven't done too much of that since the Ron Price stuff (some say that was among my most classic material ever :-). Yeah, don't think I'll ever live that down... but I suppose there are worse things to be remembered for :-P Even though I didn't win, that ad *did* seem to get lots of people thinking about how there's too much big government involved in education. Johnny, cannot and does not have answers to my questions. Verily he has failed to not only answer me, but to frighten me, or to make me back down. He ran away like the person with no real answers that he is, when I confronted him with facts and truth. He has continually failed to apologize for his false statements even when proven wrong, beyond a reasonable doubt. And furthermore has continued to RUN away from my light of truth shining upon his misguided ways. Its funny, he tried to answer me at first, and now he and his cronies are no where to be found. Even Shawn Heath Paden. I'm a student at a Church of Christ affiliated college here on the West Coast. Johnny Robertson is discussed often in CoC theology classes here about what CoC IS NOT meant to be. Mr. Robertson is the bitter fruit of the early teachings of Daniel Sommer and Carl Ketcherside. Both Sommer and Ketcherside renounced their original teachings and sought peace with all Christians but some like Robertson cling to it still. But the main reason for me writing was to tell you that the material from your blog is also used in our discussions about Mr. Robertson. I'm going to bring your Children of the Corn mockup into our class tomorrow. It's hilarious! Interesting that you mention Daniel Sommer. He was probably the most influential of all of the "hyper legalist" Church of Christ preachers. And as you alluded, toward the end of his life he came to regret all of the rancor that he had caused and tried his best to make up for it. But, the damage was done. His own son even disowned Sommer after he turned away from his original divisiveness. I found some photographs of Daniel Sommer from across his life. In his younger days there was a fire in his eyes... but I don't know if it was a fire for Christ or a fire for what he demanded was "the real church". And there is a drastic difference between the two. And then there is a photograph of Sommer taken much later, I'm assuming it was when he was in his seventies or eighties. It's certainly the same man... but by this point there was a haunted look in his eyes. It's the face of a man who recognized at last the pain and suffering that he caused with his teaching, however well-meaning he may have been. It was the face of a man who was looking forward to the inevitable, if only to escape at last the shame of what he had done and the regret that he could not make up for it in this life. I saw that photo, and my heart broke for Daniel Sommer. You wanna know something? What Robertson, Oldfield and their followers are doing is a very wicked thing, especially when they stalk and harass others who are trying their best to seek after Christ. Robertson and his followers are no more perfect in THEIR understanding of God than any of us, myself included. But as much as I hate to see them bully others and am trying to do something about it, I also do not want Johnny Robertson or anyone else to finish out the days of their life as Daniel Sommer did. Unrequited repentance can be the worst misery there is. And it's not something that I or anyone else should want to see anyone suffer needlessly. Chris Knight, what a breath of fresh air your words above brought, thank you. I was raised in the CoC and spent two yrs at FHU in the early 70's. And after my father's Baptist mother died in 1970 walked away...for 40 yrs. Why? While standing at her casket a member of the church came up to me putting her arm around me stating, "too bad she wasn't a Christian". My, response was, everything I know about the Lord,bthe Bible and prayer I learned sitting at her feet...I walked away and didn't look back. What a horrible way to offer sympathy to the grieving, all but saying, too bad she is in hell. I have returned to the church of my youth and have been for two years and am loving it. But found Johnny R today by accident really was embarrassing. He is an idiot, you cannot use the churches of Christ salute you as a proof text and the way he did it was ridiculous.